A lot. In theory I could end the post there, but what fun would that be? The Toronto Maple Leafs have until December 1 to sign restricted free agent William Nylander, or else he can’t play for anyone for the remainder of the season. That’s a little over two weeks away, and it appears that the Leafs and Nylander have not made any progress. The Leafs prefer a multi-year deal at $6 million per, while the Nylander camp wants $8.5 million. That’s a pretty significant gap. There aren’t many options for Kyle Dubas with their 22 year old stud winger. They can either hold firm and risk losing him for the year. They can cave to his ask and have a potential cap issue down the line. Or they can trade him. The trade rumors have swirled, and now it’s just Dubas doing what he must. It’s worth noting that waiting for an offer sheet is possible, but offer sheets aren’t common. Before we can get into what a realistic offer for Nylander is, we need to look at the player himself. Nylander has back-to-back 20-goal, 60-point seasons (22-39-61 and 20-41-61) while playing on Toronto’s top line. Sixty point wingers under 23 years of age don’t grow on trees. The thing with Nylander is that the Leafs are a dominant team with him on the ice. Even if we can’t find much data of his performance without Matthews, the Leafs dominate shots, scoring chances, and goals when he’s on the ice. He simply drives offense. Nylander’s stats have always been at the elite level. There are some obvious holes to the above chart of Nylander’s production (not all games were tracked), but regardless we see elite production. There is no beating around the bush here, acquiring Nylander would be acquiring a top-ten winger in the game today. And he’s only 22 years old. Since we now know what Nylander is, let’s look at what a trade would cost the Rangers. The Leafs have $14 million in cap space right now, which is crazy. It certainly makes things easier. The Leafs need a defenseman today to help with their Stanley Cup aspirations. That means Brady Skjei is in the deal. It’s the cost of doing business. His $5.25 million deal probably doesn’t need any retention. In terms of replacing Nylander, the Leafs would need someone who can probably get by on the top-six. Jimmy Vesey may entice them, but I’m guessing someone like Vlad Namestnikov, a more skilled winger who has shown he can put up strong numbers with Steven Stamkos, is someone that the Leafs would want. I’d imagine the Rangers would need to retain a little bit on Namestnikov’s $4 million, if only to facilitate a deal with next season’s new deal for Matthews in mind. It would only be for another season anyway. New York’s first rounder this season is out of the question, so my guess is the Rangers would have to include one of their better prospects. I’m going to assume Vitali Kravtsov and K’Andre Miller are off the table (along with Filip Chytil and Lias Andersson). In this scenario, it’s probably a “pick one” of Nils Lundkvist, Ryan Lindgren, Ty Ronning, or Tim Gettinger. I”m going out on a limb and saying Libor Hajek is off the table as well. The Rangers value him highly. With that quality of prospect, I’d assume –since the Blueshirts’ 1st rounder is off the table– that the conditional 1st from Tampa would be included. Let’s also assume that there is a provision that if Tampa does not win the Cup (which turns that 1st rounder into a 2nd rounder), Toronto would have the option of swapping Tampa’s now 2nd rounder for NYR’s. So we have Skjei, Namestnikov, one of the better prospects, and either a low 1st or a high 2nd for Nylander. That’s an awful lot from the rebuilding Rangers’ perspective. But if you’re a Leafs fan, it seems light, doesn’t it? Here’s the thing though: Toronto is not going to get fair value for someone like Nylander. He is always going to be the best player in any deal made. Compounding this issue is Dubas has little leverage in this situation, and teams know it. I’d imagine a lot of Ranger fans would not want to make this deal, but can you really pass up on Nylander? 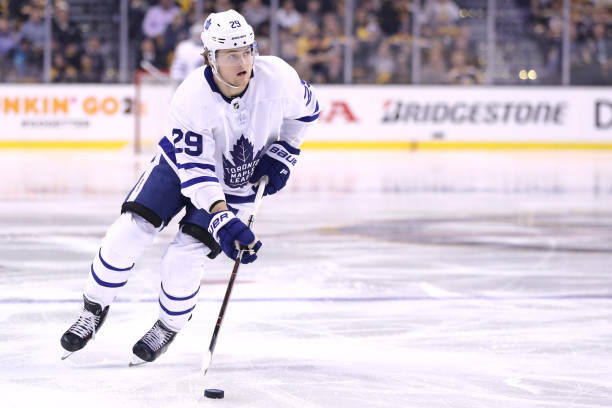 "What does a realistic trade offer for William Nylander look like? ", 2 out of 5 based on 12 ratings. ill get the controversy started. but ill ask this rhetorically. should lias in principle really be in the off the table group in this deal ? Hardly any Ranger is off the table for Nylander. I have been lobbying for Hajek all season long and some Ranger fans do not agree that Hajek is a top 4 D men……No offensive skill at the moment, but I have seen enough of this kid to say that he will be a major component of our D in the not so distant future…Super Intelligent …great at shutting down shooting lanes and very strong…..I would very surprised if Hajek is involved in any deal…very surprised…. I agree with you bro, which is why he was a must in the deal with TB. I think I would enjoy watching a line with Lias, Chytil and Nylander on it. Although, Kravtsov on the right wing might be almost as good and we’re saving assets in the long run. Rn, Lias on a second line is a stretch for me. I will ask – why bother? I kind of like the way things are progressing. And I liked it even before the streak. Why go out at the first of December and pull of a Sather trade which will cost several of the high-end youth and serve to deplete the little bit of depth that has been assembled???? Stay the course for once. Let the kids play- win or lose. Trade off some excess for youth and picks at the deadline,hope for a lucky bounce on the Hughes ping-pong ball, and sign Panarin without giving up a thing. I would put Lias in the deal. He is a good kid who is very competitive but has limited upside offensively. He was the wrong pick for us. The Leafs have three strong centers already, they don’t need Lias. They need defenders, but especially right handed top-4 defenders. Babcock prefers not to go offhand. I’m not sure if Skjei gets it done, Shattenkirk is too expensive, and I doubt TML want DeAngelo or Pionk. I just don’t see the Rangers as a match, no matter how many mid-value pieces we throw their way. If Lias was the centerpiece of a deal for Nylander, then no he shouldn’t be off the table … but that means no 1st rounder to TO and no other piece from the rebuild. It would have to be a quasi-rental/rental and depending on which quasi-rental/rental they might have to throw something back at us. I have no doubt Nylander is the best player in the deal, at least offensively — but we also have to bear in mind that great teams aren’t made up of all better players … you need guys that excel in various aspects of the game. Now whether Lias becomes a competent offensive player while excelling in other areas as well is to be seen, but my guess is the FO sees him as that type of player. The Leafs need D men and the Rangers don’t have any worthy of making this deal. The Canes can offer D men, a guy like Pesce, who is only 23 and locked in for years at a reasonable $4M per cap hit, I would think would be a very attractive target for the Leafs. Don’t forget, they have to deal with Matthews and Marner next year with their contracts. Forgetting about cap space, a Nylander for Trouba swap makes perfect sense, but then the Leafs would have to pay Trouba and that will be difficult next year, given the Leafs cap situation. I have said it over and over, Nylander on the Leafs is worth $8M per. Nylander on the Rangers MAY NOT be worth $8M per. There is no doubt in my mind that Nylander’s stats in Toronto are, at least partially, driven by his Leaf teammates. That is a very talented forward group they have up there. Not saying that I would not love to have Nylander here, I would, but the trade cost to get him and the contract that he would need would exceed his production here, IMO. Would he be an 80 pt per year player here? That’s the question for all of us. No. No, he wouldn’t. And I’m basing that on the fact that he never hit 80 points playing with much better line mates in Toronto. If NYR trades for Nylander then there is no rebuild, just the usual NYR front office short-sighted desperation. Agreed! This is a “final touch” to a rebuild, rather than the start of a rebuild. Stay the course! That’s my opinion as well, which is why you do not pursue this player. Again I find myself agreeing with the Candidate. Why are Ranger fans so obsessed with players on other teams. Why trade away the future for a Leaf who has has 2 back to back 61 point seasons. Further he is seeking a king’s ransom to resign which burns up capspace. Stay the course Gorton…don’t take the bait. I agree Richter1994…….As the outer limits are reporting that Panarin wants to be Ranger…..Panarin or Nylander? Which would you prefer?……Panarin would be an off-season signing as Gorton has said on numerous occasions…Picks and prospects are not being moved…. I’ve said before bro, Panarin at $9M per over Nylander at $8M per pls the trade cost, all day long. Panarin has proven to drive play for his teammates, Nylander has not. Not even close of a choice IMO. I’d walk away if this is the deal, way overpay. Nylander has too many questions, can he produce at the same rate without Matthews, will his contract demands be too high, and what will it do to the rebuild?????? Sorry, we should play out the season, make our deals at trade deadline, get as many picks as possible, and continue with the rebuild. Look at the results so far, I can wait another season, or two, after all in my lifetime I witnessed one cup in 78 years, so what’s the rush????????? I am of two minds on Nylander. First time I saw that kid play I wanted him on the Rangers badly. He is an excellent young hockey player and no, his stats are not just because of playing wikth the other worldly Auston Matthews. But, he is going to cost the Rangers a bunch in players and money to acquire. Other teams are going to bid up the deals and Toronto will get a lot of offers for him. He will cost the Rangers some good young hockey players and picks. Then he will also cost 8 million a year. So, a reluctant pass on Nylander. Walt, I hope you are feeling better my friend. Dave wasn’t proposing one of the better prospects. He was proposing a credible prospect. There is a fair chance that the four players mentioned won’t play 100 NHL games combined. Ronning is often a healthy scratch at Hartford and Lindgren doesn’t look like much of a prospect. Gettinger is still a maybe and I am hopeful about Lundkvist, but Dave did take all of the better prospects off the table. Nylander >>>>> Skjei, Forwards are far more valuable than defenseman. Nylander >>>>>>>Namestnikov, this is an absolute no brainer. Nylander >>>>>>>>>>>>>>>>>>>>>> any draft pick, who you hope can do what Nylander has already done. If the cost is literally only those four you make that trade in a heart beat. However, the suggested trade would result in a dial tone from the Toronto end of the line for the above reasons. John, my issue is whether Nylander would be as good on the Rangers as he is on the Leafs. IMO, I do not think that he would be. If the price is Namesnekov and one of the names you mentioned, make the deal. I bet they want Pionk. Namestnikov and Pionk. No picks, no other “assets”. We shouldn’t be making any trades now unless they offer us a sure long term upgrade, period. I didn’t think the NYR would be in on this Nylander situation, until I saw that line. JG does not know how to manage with leverage…at all. For examples, just see pretty much any deal he’s made all the way up to giving away picks for McQuaid for no reason. So there may very well be a Nylander trade in the works here. For the simple reason that JG will be open to “fairness” while the other GM’s try to use that leverage. Dubas will prob get the extra pick or better player from JG while the other GM’s hold tight. I wouldn’t consider ANY player off-limits in this situation. I’m worried about the 8m you need to pay him. If money was not involved I would make the deal. I don’t think they would accept Pionk Skjei woul need to be the starting point. Shatty might be interesting to include though. If you are going to pay that kind of money, aren’t you better off waiting until the end of the season and signing Panarin? Though somewhat older, he is still young, and is just as good if not better than Nylander – and he won’t cost you players. Despite all the gossip, Panarin is NOT a sure thing. If we can rob some other team while waiting to see what happens with him, go for it. Panarin is not young in terms of the NHL. He’ll be 28 next season. He’s going to struggle to maintain his production levels and his contract will be a bust, like almost all high profile UFAs in the NHL. Dubas has all of the leverage in this situation. If Nylander does not sign by 1 Dec- Nylander stays Toronto property. Nylander loses ‘x’ millions of dollars per year that he chooses not to play, Dubas has a contract spot open and is able to play other players to fix holes. If Nylander signs, Dubas gets an asset at the offer Toronto wanted. Dubas does not HAVE to trade William Nylander. The Toronto Maple Leafs lose absolutely nothing if the status quo remains. Austin Matthews will be back, Toronto is 2nd in their division. It is preceived that Dubas HAS to move Nylander because the fans want to see Nylander on the ice. That does not remove the leverage from Dubas though. I disagree that Dubas has leverage. If Nylander doesn’t sign, yes he sits the year out, but he becomes a free agent. I can’t see losing Nylander to free agency for nothing, a sign of a good GM. He does not have to trade him but then he HAS to sign him, can’t let him walk for nothing. Incorrect. William Nylander remains Toronto property for another 4 years regardless of whether he plays this year or not. He is a qualified restricted free agent, the status quo remains until he reaches age 23 or 24 IIRC. The whole point of Restricted Free Agency was to give the player minimal leverage over the team, and the team more leverage over the player. The exact opposite of Unrestricted. If William Nylander is willing to sit out the next 3+ years, then Dubas and Toronto will lose leverage in that last year. I highly doubt William Nylander is willing to lose close to $10 million dollars however. The very last thing the Rangers need right now during this rebuild is Nylander. The trade would destroy what they are trying to do. Another 8.5 million dollar player and losing some of our best prospects and picks would be absolutely the wrong thing to do. Stick to your guns JG, continue on the path. Tell them Brady for Nylander straight up or we are not interested. Why do the Leafs have all the balls? they are about to lose him for the season in 2 weeks! I am not sure I would chase Nylander. Yes he is great and 23, I just don’t see him as a guy who can carry a team. And at $8.5 mill per is he the right answer? I am not so sure that he is. We also have to decide if we want to take a run at Panarin as a UFA or go after Nylander? I am not sure we can do both. But Panarin as UFA is a far better option in my view than the trade proposed in the article. Panarin may not get to UFA. That’s a risk of waiting. Given most of our D talent is still maturing I am not so sure we make a great trade partner with Toronto. I disagree to some extent. Panarin is 5 years older. Sure Panarin in the short term would bolster the team more than Nylander, but what about 3 years from now when Panarin is in his 30’s and still has 4 years left on his contract? Also, Panarin will easily garner $8.5m+ — but Nylander is actually more interested in term than he is salary. Sure he wants more than the alleged $6m TO is offering and is asking $8.5m, but chances are he would be happy to take 8 years at $7.5m. Plus he fits into the whole rebuild because his PRIME years will be the next 5-7 years. All things equal and I want Nylander, the trick is not giving up our best prospects or OUR 1st round draft choices — If that’s at all possible. I would offer Zucc and Namestnikov — who total what Nylander is asking. Then I would add TB’s pick. Here is where creativity is required. Offer them Staal and retain half salary. Sure they might get a better offer somewhere else, but you never know until you try. I wouldn’t offer them Brady Skjei because that would create a terrible hole on the left side. Imagine a left side with Staal, Smith and Claesson — you have ZERO offensive capability there from the backend. Pass on Nylander…Ranger fans need to learn patience period!!! I do not expect the Rangers to pull off any major deal this season…….Rangers are keeping the picks they have and have a vision on this upcoming off-season and next years draft……It’s to continue to refine the team…….Quinn..Boys….Gonna be a good one…. Nylander gives the top line a stud. We do not have a player of that quality at present. If the price is right, make the deal. Not only would Nylander instantly be the best forward on the Rangers roster, he would also be one of the youngest. No brainer, you trade almost anything for Nylander, certainly the package Dave proposed, then you sign him and keep him in Ranger Blue until he’s 30. Let his decline years be someone else’s problem. in terms of 8M for (lets say 7 years) – that puts him at 28-29 years old at term. hmmm, we have guys making 4-5.5M in at almost equal ages, due increases soon…. Pretty idiotic to think 5.5 for Hayes when he’s basically making 5.2 in just 1 yr. If he takes the pay cut than 5.8 plus a little change will do it. Rangers will resign in that ball parks, reports are all over that he should be able to see 6 mill or more. Man I am back and forth on my opinion on a deal for Nylander! I am easily persuaded because as I said on my earlier post I have coveted him since he broke in. If the deal is one the Rangers can live with, perhaps they should get him. They have a stable of centers in Zibanejad, Hayes, Howden, Chytil, Andersson. Where they are lacking is on the wings. Nylander would without a doubt be their best winger if he was acquired, and he is young. A kid like him doesn’t come along every day. So, if they can somehow avoid giving away their young players and picks, go for it. I am just afraid that the price for Nylander is going to be high. I gave you a thumbs up because I think your reasoning is solid, except for the fact that Nylander wants too much money. With the Cap, you just can’t pay that type of money anymore, not if you want to win the CUP! Unless, of course his name is Crosby (10 year ago), McDavid, or Gretsky (30 years ago). Alas, his name is Nylander, let’s not overdo this we’d be bitching about him middle of 20-21 begging for a buyout to rid ourselves of another anchor! He’s asking TO for $8m+, but that’s because they want to do a short term bridge deal — I bet if you put $7.5m for 7-8 years he’ll gobble it up … and yes, we can afford that and he’s young enough to never make that deal look bad. Gretsky!!! Love it!! don’t tell Wanye!! Top 4 and a top 9 name. If Skjei and Vlad could get it done than the Rangers would win that trade right now and in the future. Who do you replace Skjei with? You want a trio on the left side of Staal, Smith and Claesson? Say you bring up Hajek and he performs well, it’s still a weak left side without a true 1st pairing D’man — and Skjei may or may not be one, but he’s the closest thing we’ve got to that on the left side. You’re fixing one hole by creating another.